Published: Oct. 10, 2011 at 02:00 p.m.
And for his next miracle, Tebow turned water into Gatorade. The Lions are playing in a big game on Monday night -- yeah, let that sink in for a moment. So far, 2011 has been a year of change, and there was no bigger example of that than Week 5. The Raiders took the field without Al Davis looking over them for the first time in most of our lifetimes. And there might be a new football messiah on the horizon, too, in Denver. With that in mind, here are the six biggest tending topics in the NFL following an outstanding Sunday. Given the trouble he had in a sideline interview with Suzy Kolber years ago, it might seem like Joe Namath giving instant analysis on the Jets via Twitter would be a bad idea. Instead, it has turned out to be a great idea. Imagine what Joe might say if he really let loose. At least Namath's tweets are taking attention off just how bad that team is. The 49ers' magic number for clinching the NFC West is down to one game after an impressive blowout of the Buccaneers that was reminiscent of the 49ers' dismantling the Cowboys in the 1981 regular season. Oh wait, did I just compare Alex Smith to Joe Montana? I might need to rein that in. But the 49ers are 4-1 right now. Maybe we should not anoint the 49ers so quickly considering that the Seahawks beat the Giants in New Jersey. This would be a bigger story if the Eagles weren't intent on making their neighbors, the Phillies, look like overachievers. The Cowboys seem functional by comparison. The real question: Is the NFC East the worst division in football? No, the NFC East is 6-2 against the NFC West. Has it come time to recognize the fact that the nickname Matty Ice is meant to be ironic -- like calling a fat guy "slim," a tall guy "tiny," or calling Tony Romo "clutch?" The nickname does not fit. The next time Ryan picks up a team and puts it on his shoulders will be the first. There is not enough space to devote to the impact that Al Davis had on professional football. But it seems fitting that the day after his passing, two players he was ripped for drafting came up big in the Raiders win -- Sebastian Janikowski and Darrius Heyward-Bey. The football world will miss Davis. You got your wish Denver, Tim Tebow is likely your starting quarterback and what a difference he made. 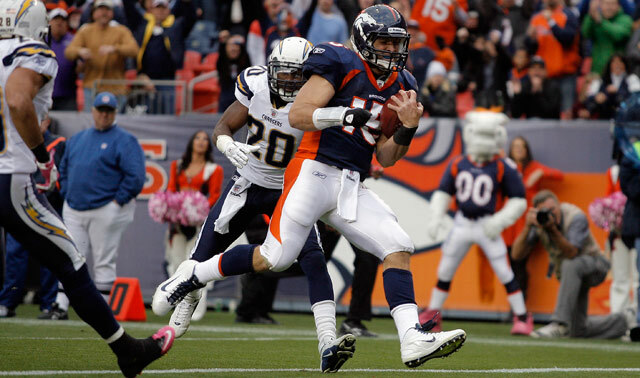 Tebow was simply awesome in leading the Broncos to a come-from-behind victory over the Chargers. Wait, what? The Broncos lost? Oh, I had no idea looking at all of the highlight packages. What can we expect from Tim Tebow in two weeks? Talk about it via Twitter or via Facebook. Be sure to catch the latest on the Dave Dameshek Football Program.